A study conducted by the UN Food and Agriculture Organization (FAO) shows that roughly one third of the food produced in the world for human consumption every year — approximately 1.3 billion tons — gets lost or wasted. When it comes to Romania, a European Commission report shows that the country ranks 9th in European Union countries for food waste. On average, every Romanian throws away 97.5 kilograms of food per year. Hence, FWC organized a week of food waste combat in order to reduce food waste and to increase awareness about this issue. 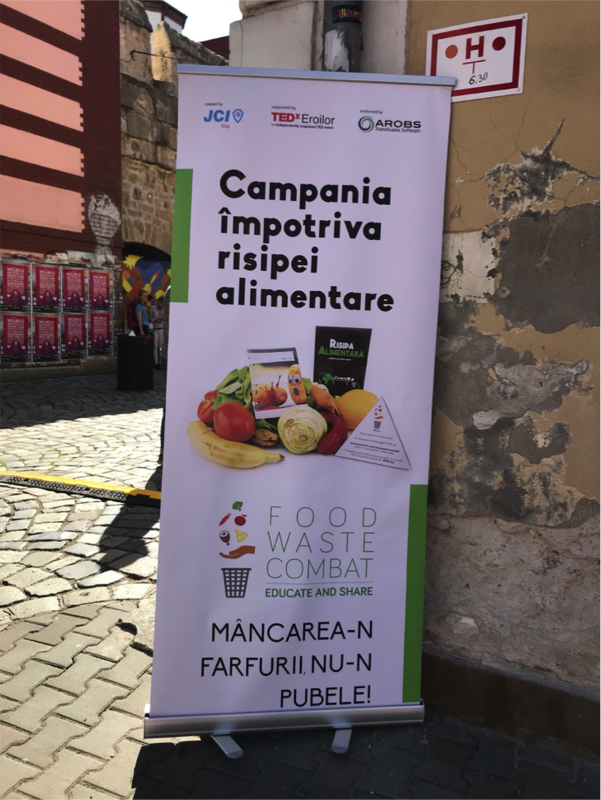 Food Waste Combat (FWC) is a project within Junior Chamber International (JCI) and TEDxEroilor that focused on food waste. They held an event called Masă în stradă cu foodtruck-urile or Lunch on street with the food trucks. 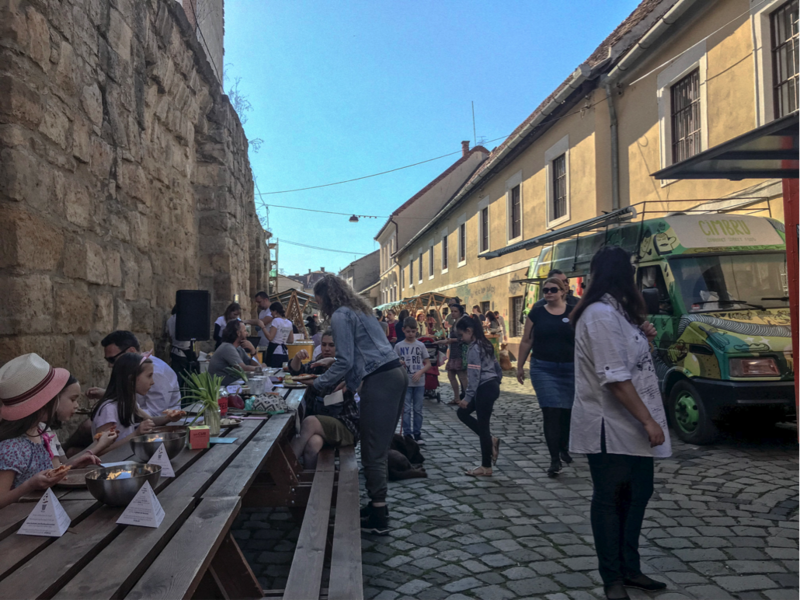 The event took place on Saturday, April 21, 2018 on Potaissa Street, Cluj-Napoca. The event on Saturday was actually the final day of a main event from FWC, which was called Food Waste Combat Week. FWC started Food Waste Combat Week on Monday, April 16, 2018 with the screening of a movie at Cinema Măraști, Cluj-Napoca. “We had an event on Monday at Cinema Măraști in Cluj, we had a documentary and a Q&A session with people and we had like 75-80 people that joined the event. We are talking about the objective in (our) project and how we are actually planning to target more audiences”, Camelia Moldovan said, one of the volunteers for FWC. The second day of Food Waste Combat Week implied a guided tour to local markets. FWC considers that by going to local markets, we can reduce food waste. Thus, they organized the tour to discuss with people about different kinds of vegetables and foods and the importance of less demand of “aesthetic” standard in local markets for vegetables and fruits. “We are talking about changing the approach that we currently have around vegetables, for instance, because we have this aesthetic standard in supermarket and we are basically throwing up a lot of ugly vegetables which are still eatable, but they consider them ugly, therefore they don’t buy them”, Camelia Moldovan explained. During the third and fourth days of Food Waste Combat week, FWC focused on their social media. Through their Facebook page, they started a challenge on Facebook to ask people to show their fridges, using the hashtag #showmeyourfridgechallenge. 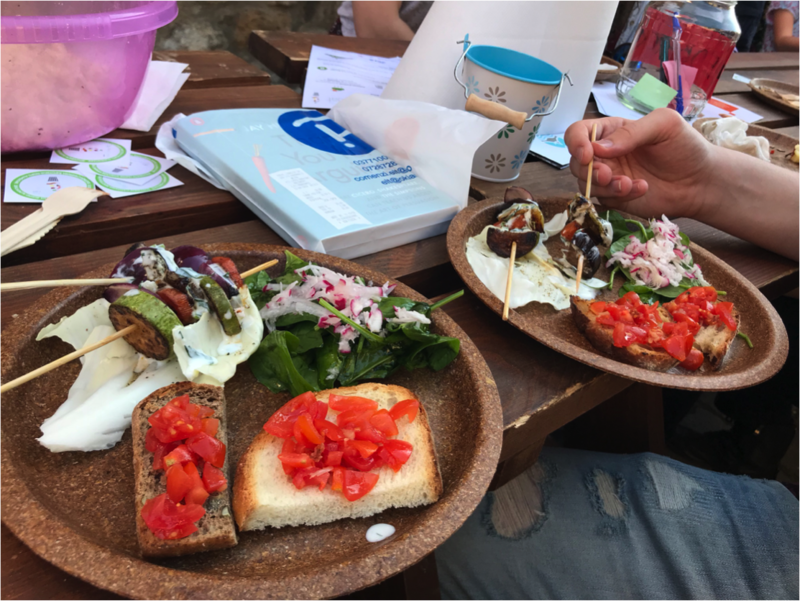 The next day, they proposed people in Cluj-Napoca to join an app called OLIO – The Food Sharing Revolution, which was developed in the UK, but is available worldwide. On that app you can exchange your foods to other people around you. For example, when you have excess food, you can put the information there and somebody maybe will take it out, so you don’t have to waste food. Furthermore, on the fifth day, FWC held an event called Treasure hunt Food Waste Combat. People who joined this event made into teams where they a followed route with hidden things that needed to be discovered. At the end, the treasure hunt lead them to a prize. The treasure on this event was food, so the FWC intended to show people that all foods, even imperfect vegetables and fruits that are hard to sell, are hidden treasure. The last day of Food Waste Combat Week brought long tables and benches provided by FWC for people to enjoy their food ordered from three trucks. Some people were attracted by the foods from the trucks because they were able to choose how much to pay for them. Also, all the foods were made from ingredients that were meant to be thrown away. “I got attracted by the banner and decided to see what’s going on here. I was more curious when they said that the foods were made from ingredients that were about to be thrown away. Also, I could pay as much as I wanted for the food, so it felt like a donation,” said Ramona Muntean, one of the visitors. The charm of the sixth day of Food Waste Combat Week was not only about the foods from the three trucks. There were also some workshops. For example, in the culinary corners, adults and children took part in cooking experiments with ingredients which would have been thrown away otherwise. They cooked foods such as ravioli or smoothies. Other workshops showed people how to do compost, detect counterfeiting in trades, adopt ugly vegetables and so on. “The little workshops or the main idea of reducing food waste is about what ingredients do I have in my house, so I can cook delicious meals without wasting anything. It’s also about eating everything from the plate, using any leftovers you put in fridge and eating them the day after. That’s basically the same here: we have smoothies, ravioli, popcorn, etc.” Camelia Moldovan said. All the plates used to serve foods from the three trucks were made out of eatable weeds. If people didn’t want to eat the plates, they could just threw them away, and all the used plates were guaranteed to decompose in 30 days. “We are also talking about reducing the plastic, because we have these weed eatable plates. You can eat them, but also they decompose in 30 days. That means those can be absorbed back into nature, and can be used as fertilizer,” Camelia Moldovan added. The FWC has been organizing similar events for past 2 years. “The event has been going for the past 2 years and we have been organizing dinners around the city, like huge outdoor tables on the streets. Everybody can come with their food and we also cook using waste food from the supermarket. We are also in here to discuss with people, to engage with them, to discuss about food waste, what do they think, what are their habits. The final purpose is to change their habits and make them think more, for example, when they do groceries shopping,” Camelia Moldovan explained. FWC’s intentions and people who care about reducing food waste in Romania have some obstacles to face, as there is a backward from the Romanian government to combat food waste in Romania. There is a draft of law no. 217 from 2016 on food waste reduction which has not been officially implemented until now because the Romanian government has suspended this law twice. The law no. 217/2016 on food waste reduction should have officially been applied on May 27, 2017, a year after it was issued. However, its provisions and implementation guidelines were not approved, which made the Romanian Agriculture and Rural Development Ministry to issue a Government Emergency Ordinance 45/2017 on June 30, 2017, as stated by Romania-Insider. Based on that, food waste reduction law was suspended until December 31, 2017. However, it got prolonged again with 6 more months, until June 30, 2018. Based on a press release that the Agriculture and Rural Development Ministry published on their website, they had to postpone the implementation of the food waste reduction law because the current form of law cannot be applied, as it does more harm than good. Also, they conclude that the law is not clear, precise and predictable, alongside explanations about their point of view on the defective law. As the law has been suspended twice, Camelia Gui, the Project Manager of Food Waste Combat, talked about what goes wrong with the implementation of the law. “This law has been issued twice but never got into effect because they kept having blockage in terms of what are the implementation details. It was only the Ministry of Agriculture and Rural Development that got involved, but in fact there are more complex issues. You need someone from the (Ministry of) Environment, someone from the Ministry of Economy to come all together and study the impact and multiple implications of this law. However, they never did that and because of it, there are a lot of provisions in that law that don’t make sense in Romania or would be very hard to implement,” Camelia Gui explained. In addition, Camelia Gui gave some explanations about the problem regarding the expiry date label on food item. Everywhere around the world, the confusing expiration date label on food item leads to food waste. “In Romania and other European countries, you have this problem with how you express the expiry date. People don’t really use it properly and actually consumers don’t know how to read the expiry date. There are very many ways to express availability and freshness and even safety of an item or food item, but people don’t really know what it is and interpret that and because of it, a lot of food waste happens.”, Camelia Gui said. There are two ways to read common expiry date label on food item. First is ‘best before’, which refers to the quality or freshness of the food, not the safety. Therefore, if a food has passed the expiration date, the food is technically still safe to consume. Second is ‘expiry at’ which refers to the safety of the food. Thus, if a food item has passed the expiration date, it is not safe anymore to consume. The draft normative act of the current form of the law no. 217/2016 initially published to clarify public debate about what food means “near the expiration date”, according to avocatnet.ro. The problem related to the confusing expiration date label on food items is still consider trivial, because many people are not aware that they have been interpreting expiration date wrongly. “The consumers don’t know exactly what the differences are and if they see something like ‘best before’ on something like juice, they’ll be like: I’m throwing this away because it’s no longer safe to drink. First of all, people are not properly informed about how to interpret the date of expiration and second of all, our legislation is not clear enough. You could find cheese that has both of the ‘best before’ and also ‘expiry at’, which is not ok at all, because cheese itself is a food item that’s already passed and should have a fixed date of eating. The fact that a food item like cheese has two types of expressing the availability shows how wrong the whole thing is in the Romanian system and it’s not even safe or clear,” Camelia Gui explained.